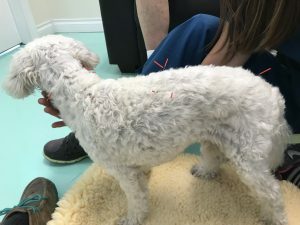 Jackson presented for acupuncture to improve his hind limb ambulation after diagnosis of Intervertebral Disk Disease (IVDD) that left him paretic in the hind end. Jackson was treated initially with laser, rest, and pain medications immediately after his injury. Regular acupuncture sessions were added to his treatment regimen a week later to improve his hind limb ataxia and ambulatory response. Jackson’s neurologic deficits have greatly improved, but he has continued to have a right hind limb gait abnormality thought to be related his previous patella laxity and stifle arthritis. This may have been worsened by the paresis from his spinal disease. 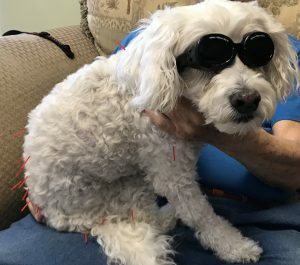 Jackson is doing well with his sessions and will continue to have regular acupuncture to address his musculoskeletal and systemic health concerns as needed. Jackson is a 15 ½ year old neutered male Cockapoo with an extensive history. He has a history of recurring pancreatitis, but has been stable on a prescription turkey and fish based diet from JustFoodForDogs for over 1 year. He has early stage heart disease from Tricuspid valve regurgitation that is maintained with Benazapril and Pimobendan. Jackson’s owners report he has had surgical repair for patella luxation bilaterally when he was 2 years old. He had been going to regular chiropractic adjustments and swimming sessions for arthritis associated with his stifle disease, which he had participated in the day prior and the day of his spinal pain. On April 25th, 2018 Jackson presented to another doctor in our clinic for back pain and instability in his hind limbs. He was ataxic, knuckling, crossing over, and unable to stay up in his hind end. Radiographs that day showed spondylosis from the 12th thoracic vertebrae to the first lumbar vertebrae, and along his lumbar spine between the 2nd and 3rd and the 5th through the 7th vertebrae. The doctor that day prescribed non-steroidal anti-inflammatory therapy and Methocarbamol, laser treatment of the lumbar spine, and rest. Laser treatments were prescribed by the initial veterinarian to be applied over the next two days using a Companion Therapy Class IV Laser with settings of 750 J / 6 watts for 2 ½ minutes, and then tapered to weekly treatments. 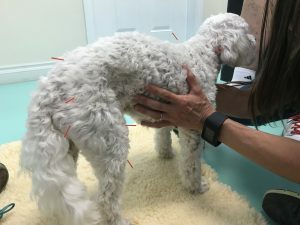 Jackson presented to me on May 2nd, 2018 for acupuncture to improve the function of his hind limbs in addition to his current treatments. Upon presentation, Jackson could ambulate with all four limbs, but his hind limbs often crossed and slipped, causing him to fall over when walking. Jackson’s right hind limb knuckled occasionally and internal rotation of his right stifle was present. His conscious proprioceptive response in both hind limbs was severely delayed. Myofascial examination showed taut bands in the cleidocervicalis muscles of the neck and biceps muscles. He had significant sensitivity over the lumbar spine with postural kyphosis. Atrophy of his gluteals, quadriceps, and biceps femoris muscles was found bilaterally. Examination of Jackson’s crossed extension reflexes showed abnormalities in both limbs. Jackson also had thickening and effusion in both stifles, more prominent in the right. His vitals were stable with a grade IV/VI systolic heart murmur and no arrhythmias present. Differentials for Jackson’s hind limb ataxia include IVDD, infectious disease, degenerative myelopathy, thrombosis, hip dysplasia, osteoarthritis of his spine, osteoarthritis of his hips, osteoarthritis of his knees, among other diagnoses. Differentials for pain with lumbar spine palpation include IVDD and other above listed spinal disease, as well as viscero-somatic response from organ dysfunction. A presumptive diagnosis of IVDD was made based on presentation and radiographic findings, but advanced imaging was not pursued by the owner to confirm this. He also has previously diagnosed surgically repaired patella luxation and associated osteoarthritis within the stifles bilaterally. Jackson’s other diagnosed health concerns include heart disease and recurring pancreatitis, both of which are currently stable and maintained through diet and medications. My goal for Jackson was to reduce his lumbar spinal pain and improve ambulation and muscle tone in his hind limbs. I also wanted to provide autonomic balance and support to his gastrointestinal and cardiac dysfunction. Based on his initial history and clinical presentation, dry needling with Seirin 0.16 x 30mm needles at Governer Vessel (GV 14) and Baihui were used for autonomic and central nervous system regulation. To treat focal taut bands, Seirin 0.16 x 30mm needles were used at Gall Bladder (GB) 21 bilaterally. Seirin 0.16 x 30mm needles were also placed at Bladder (BL) 21 bilaterally, BL 22 bilaterally, BL 23 bilaterally, BL 25 bilaterally, GB 30 right hind, BL 40 right hind, and Bafeng in the right hind limb for peripheral and central nervous system regulation. The right side was focused on due to how he was being held and access to the points. Jackson’s owner was advised to continue with weekly sessions to start, pain medications as needed, and activity modification. I also recommended discontinuing chiropractic treatments at this time. Jackson showed continued sensitivity over his lumbar spine from his first lumbar vertebrae to his third. The conscious proprioceptive reflexes (CPs) in his hind limbs were still significantly delayed and crossing in his hind limbs was present. This session included dry needling with Seirin coated 0.16 x 30mm needles at GV 14 and Baihui for autonomic and central regulation. I treated him centrally and peripherally using points BL 21 through 23 bilaterally. Jackson had not tolerated the distal limb points and became more anxious when I placed a needle in Bafeng. Therefore, additional needling was stopped and I finished with massage of his neck and hind limb muscles. Jackson had a relapse of back pain and ataxia in his hind end on May 24th. His owners reported he had been doing well prior to this, showing improved stability in his hind end. He was not fully prevented from jumping on and off of furniture and begun his swim classes again. Jackson was no longer on pain medications at this time. Jackson’s CP’s were moderately delayed bilaterally and he had moderate sensitivity over his cranial lumbar spine. Jackson continued to have some ataxia in his hind end, but had less crossing bilaterally and reduced knuckling in his right hind limb. However, crossed extensor abnormality was still noted within the right hind limb. I used dry needling technique with Seirin 0.16 x 15mm needle at GV 20 and Seirin 0.16 x 30mm at GV 14 and Baihui for autonomic and central regulation. Central and Peripheral regulation using Seirin 0.16 x 15mm at Bafeng bilaterally and 0.16 x 30mm at BL 54 and GB 30 in the right hind limb was also performed. For this session, I applied electroacupuncture treatment using Seirin 0.20 x 30mm needles at BL21 bilaterally and BL 23 bilaterally using the Pantheon electrostimulator on a mixed setting of 2 and 100 for 10 minutes as tolerated. I also massaged his neck and shoulder muscles during the session for myofascial release of tension in those areas. Jackson had done well since the session the week prior. On physical examination, Jackson’s CPs were significantly improved with very minimal delay. Spinal kyphosis and mild pain with cranial lumbar palpation still found. With Jackson’s improved neurologic function, a more noticeable gait abnormality was seen in his right hind limb. The internal rotation of the stifle was more noticeable, but the limb also showed stiffness and a high stepping gait when walking. I focused on peripheral and central regulation points at BL 21 through 23 bilaterally and BL 54 in the right hind limb with dry needling using Seirin 0.16 x 30mm needles. For autonomic and central regulation, I continued with GV 20 using a Seirin 0.16 x 15mm needle and Baihui using a Seirin 0.16 x 30mm needle. I added in Stomach (ST) 36 in the right hind limb for both peripheral regulation of knee pain, as well as autonomic regulation. I did not do any further needling at this time since Jackson was more anxious today with distal limb needling. I finished with additional massage of his neck muscles. Jackson continued to show improvement in spinal pain and hind limb neurologic function. There was no change to his gait abnormality in his right hind limb. Dry needling at local trigger points in his neck were applied with Seirin 0.16 x 30mm needles in Cervical Spinal points bilaterally and GB 21 bilaterally. For peripheral and central regulation, I used Seirin 0.16 x 30mm needles at BL 21 through 23 bilaterally and BL 54. Seirin 0.16 x 15mm needles were placed in ST 36, and ST 34 in his right hind limb. For autonomic regulation, GV 20 was placed using a Seirin 0.16 x 15mm needle, and additional autonomic and central regulation at GV 14 and Baihui with a Seirin 0.16 x 30mm needle. A similar treatment protocol to the prior week was used, but additional peripheral and central regulation was attempted with dry needling using Seirin 0.20 x 30mm needles over the right hind limb hip triad (BL 54, GB 29, GB 30) and BL 40. I added in electroacupuncture to BL 54 and BL 40 using the Pantheon electrostimulator on a mixed setting of 2 and 100 for 10 minutes. Jackson attended his first physical therapy session to improve muscle tone and function of his right hind limb. Jackson’s examination revealed the CP in the right hind limb was slightly more delayed. His gait had no noted changes and there was some warmth over the right stifle on palpation. Local trigger points and taut bands within the neck were treated by dry needling with Seirin 0.16 x 30mm needles at GB 21 and massage. Autonomic and central regulation was applied using Seirin 0.16 x 30mm needles at Baihui and ST 36. ST 34 in the right hind limb was included to provide additional peripheral regulation of the stifle. I also applied Seirin 0.16 x 30mm needles at BL 21, GB 29 and 30 in the right hind limb. Seirin 0.20 x 30mm needles at BL 54 and 40 were placed for electroacupuncture treatment with the Pantheon electrostimulator on a mixed setting of 2 and 100 for 7 minutes. Jackson showed improvement in his hind end neurologic function each week. He continued treatments with the Companion Class IV Therapy Laser along his lumbar spine weekly. I was impressed most by his response to the electroacupuncture treatment to his bladder line, which seemed to have made the most dramatic difference in his neurologic function comparing results week to week when added. His owners and I are happy with his response and we are going to continue treating him every other week at this time. Our focus for future sessions will be on his hind limb stifle pain and instability, spinal pain and dysfunction as needed, gastrointestinal function, and cardiac function if he will tolerate additional needling. His owners are going to continue weekly physical therapy sessions to try to improve muscle tone and support for this stifles and hind end function over the next month. Jackson has been a great long-term case and I have really enjoyed seeing his improvement as we progressed through treatments. I plan to do more research on use of physical therapy and acupuncture for patella luxation and stifle pain in hopes that we can continue to improve his right hind limb function and comfort.